During the holidays, don't forget about our four legged family members. Our "furbabies" are like our children to us. Just like kids they can be rowdy, silly, make a mess, and smell up the house, but we love them all the same. So, they all get Christmas gifts every year, just like the rest of the family. 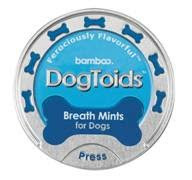 Bamboo sent us some of their wonderful pet products to try. Bamboo says "Smarter, Safer And Just Plain Better! Bamboo celebrates pets by taking a fresh look at everything from nail clippers to feeding bowls. Our products are designed to make pet parenting easier and more fun!" I think they certainly succede in that. They offer high quality products at reasonable price, that truly make pet parenting easier and more fun. Their website is full of wonderful information and resources, such as pet information, e-cards, and pet gift guides. They also help you find where to buy their products, either locally or online. I am very impressed with Bamboo. 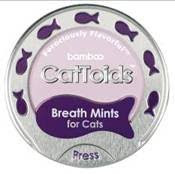 These are breath mints for your furry friends. I am happy to report that they work really well and the animals love them. Cookie spends a great deal of time knocking the CatToids container off the shelf and trying to open it by batting it around the kitchen. I am guessing that means she really likes them. Of all the dog toys we've ever owned, this one is Shelby's absolute favorite. These are basically balls that look like cats with legs and a tail. You get all the tossing, bouncing, chasing action of a ball along with the bonus of having multiple places to grab it. Shelby does not get tired of chasing her Wonky Bonkers, our arm gives out way before she does. So, if you have a dog that loves to fetch and chase, I highly suggest adding Wonky Bonkers to your toy arsenal. We have big dogs that are quite hard on toys. Finding toys that are safe for them to have can be quite challenging. I am absolutely thrilled with Rubber Neckers because my rowdy bunch has put them to the test and they stand up beautifully. The girls have played tug of war with them, chewed on them, tried to bury it, and even slept with it. This is Dixie's favorite toy and the only problem we've had is that she does not like to share it. So, if you have big dogs that are tough on their toys, Rubber Neckers might be a good option for you. I cannot say enough good things about Show Gulls. First of all, they are really cute and I just love the name! But, what really impressed me was they are the first toy that Annabelle has shown any interest in. Ever. That says something to me. She loves to bat it about, carry ti around, and even chase it across the room. Yes, we now have a cat that wants you to play fetch with her. It has kept both the cats entertained for hours at a time. Cats can be so finicky, it's nice to have a toy they really enjoy. This one is a hit with our two. I so wish I had pics of the girls playing with their toys. Unfortunately, the dogs tend to be so rambuncous when playing that all my pictures ended up being blurs of fur. As for the cats, Annabelle is under the recliner with her Show Gull and refuses to come out. So, I guess you can say they are too busy enjoying themselves to be photographed. 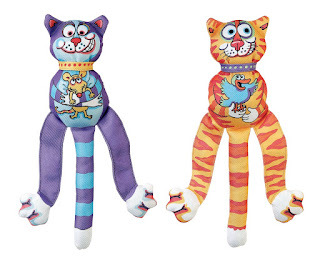 These toys would make great gifts or stocking stuffers for the pets, or even pet lovers in your like. I know I am always excited when I get a gift for the girls. So, keep them in mind when you are doing your shopping this year. 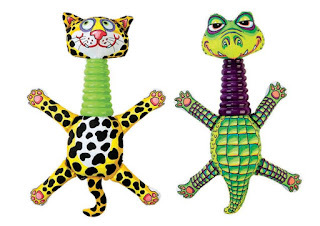 Want some of these great toys for your own pet kids? I have one Wonky Bonkers and one Show Gull to give to my readers. To win, simply leave me a comment telling me which one you'd like to have. This is mandatory for entry. Deadline to enter is 11:59pm CST on 12/15/09. Good luck! Would love the Wonky Bonker!!! My dog would have a great time with this:) Please enter me. Thanks!! And a follower through Google Connect. Our Ofie (boxer) would love the WonkyBonkers! She's been a very good girl! Thank you. My new baby Shih Tzu would absolutely love a BonkyWonker!! I'm the first entry...yay! I think I'd have to go with the Wonky Bonkers for Kevin's new dog. He already plays fetch with tennis balls. I am a follower on Google! yay 2 entries for me! We'd love the Wonky Bonkers.